The Graco Pack 'N Play Playard with Reversible Napper and Changer offers the comfort of a napper with the convenience of a changing table, all in one product. The beautifully designed soft fabric is gentle on baby's skin and can be wiped clean for easy cleanup. 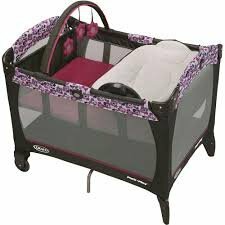 This Graco Pack 'N Play is designed to grow with your child from newborn to infant to toddler. Flowers are a little girl favorite, so the Pammie fashion will be too! Vines of soft lavender, charcoal and pink flowers are complemented by solids of the same colors.